Please take proper care of your pets. Native to: The savannah monitof can be found in Sub-Saharan Africa, from Senegal to Sudan. Found north of the Congo river.savnnahas Live in tropical savannahs with seasonal drenching monsoons, and extended periods of parched weather. 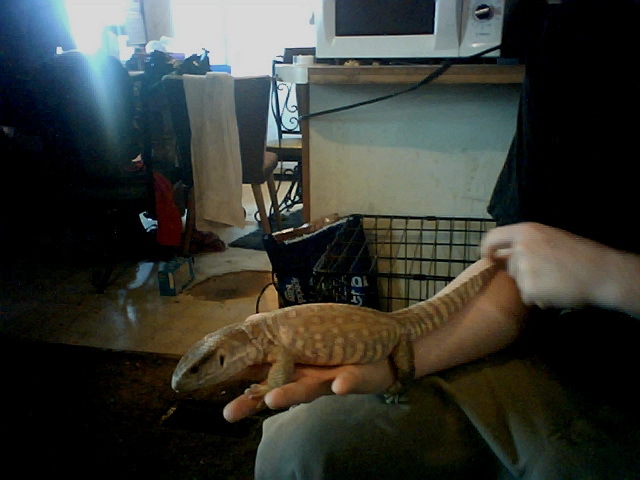 Size: Savannah Monitors typically grow to 2.5 to 4 feet, although rare 5 foot specimens are known. Life span: 10 to 15 years if given proper care. General appearance: The savannah monitor is a stocky monitor with a blocky head, equipped with large, powerful limbs and large claws. The neck and tail are short for a monitor, but still long compared to many lizards. It is color can be shades of brown and grey, typically with faint pale spots on its back, darker bands across its tail, and a white underside. Enlarged scales on its neck give it a pebbly appearance. A long, forked, purple tongue is used by the lizard to smell its environment. Enclosure: Adult savannah monitors will need a set-up about the size of a dinner table or large sofa. Plan on 4 feet by 8 feet of floor space. Limit ventilation, especially on the hot side of the cage, to prevent turning your enclosure into a dehydration machine. Avoid using wire mesh of any kind, instead use glass or plexiglass to maintain adequate humidity. Young savannah monitors can be maintained in aquaria of appropriate sizes with a basking light set overhead and a sheet of plexiglass over the top to limit moisture loss. Temperature: The cool side of the cage should be between 75° and 80° F, with temperatures increasing to 90° to 100° F on the hot end with basking spot.the basking spot should be as large as the savannah monitor's body temperatures under the basking spot should reach 110° to 130° F. Night time temperatures can fall to normal room temperature. Heat/Light: A warm basking spot should be provided for this monitor by radiant light. Racks of flood lamps work well for this, plan on 3 to 4 lamps at 60 to 120 watts each. Adjust the height above the basking spot to reach the ideal temperature. Supplemental heat can be supplied by large, robust heat mats such as "pig blankets." The savannah monitor should be able to rest its entire body on the mat. Ultraviolet light is not necessary. Substrate: Dirt provides the best substrate. It needs to be deep enough to allow the savannah monitor to construct tunnels and burrows naturally. This provides not only security, but helps with regulating humidity and temperature. Fill the savannah monitor's cage to a depth of two feet. Environment: Be careful not to let your savannah monitor get too dry. Aim for humid-tropical air without making the cage wet. Savannah monitors become inactive in the dry season; a dry cage coupled with readily available food will lead to obesity and health problems. Logs and sticks, particularly hollow logs, provide exercise and entertainment. A large cat litter pan can be used for providing water. Diet: Insects can make up the bulk of the savannah monitor's diet, supplemented by an occasional rodent. Lightly dust insects with a reptile vitamin and mineral powder. Large cockroaches, such as Madagascar hissing roaches, are especially relished. If you can collect snails and earthworms from pesticide free areas, add these to your savvanh monitor's diet to round it out. A diet based largely on rodents may also be used, but it is unknown if this will cause health problems in the long term (wild savannah monitors eat almost entirely invertebrates). Feed whole food items whenever possible, avoid canned foods, cuts of meat, and cat or dog foods. Multiple small food items are preferable to one large meal. Feed daily. Savannah monitors are prone to obesity, feed juvenile monitors as much as they will eat but adjust the diet of adults as needed. Fasts, possibly lasting several months, may be useful for controlling weight. Maintenance: Clean up feces and urates as soon as you notice them, inspect the cage at least once daily for cleanliness. Replace the water when it becomes soiled or dirty and scrub out the dish. The top substrate can dry out, but make sure it remains moist (not wet) underneath. Add a few buckets of water to the cage as necessary to keep the substrate slightly damp.